On the 26th of October 2011, I had the opportunity to cross into North Korea, under the supervision of the South Korean and US military. 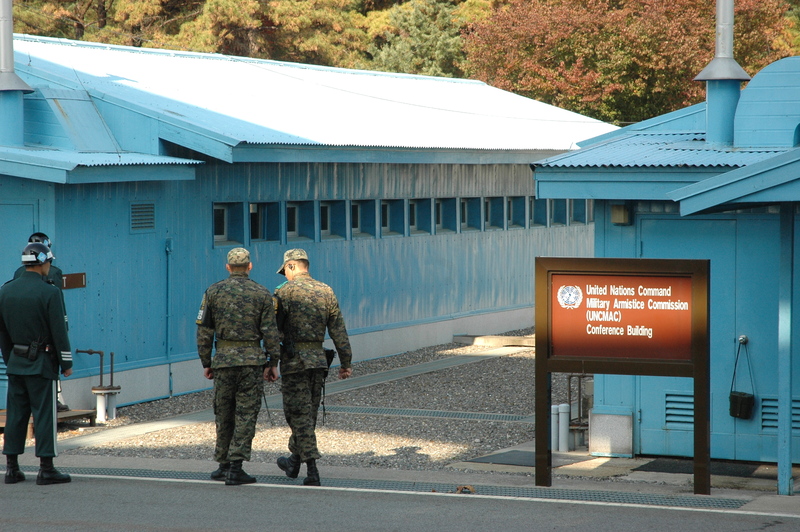 I passed over the disputed 38th parallel in the demilitarized zone (DMZ) that has been the divider for the past sixty-seven years and is governed by the United Nations. This opening in the boundary is located in an elaborate shed with rectangular divisive tables used for supposed negotiations. As I observed this diplomatic battle ground, I thought it might be more advantageous to share a round table, making it more difficult to decipher the contested imaginary latitude line. After the end of World War two and the collapse of Japanese occupation in Asia, a vacuum of power was left in Korea. It was decided to divide the country along this contested latitude line, the North temporally controlled by communist Russia and the South democratic America resulting in ten million citizens separated from their families after the split. 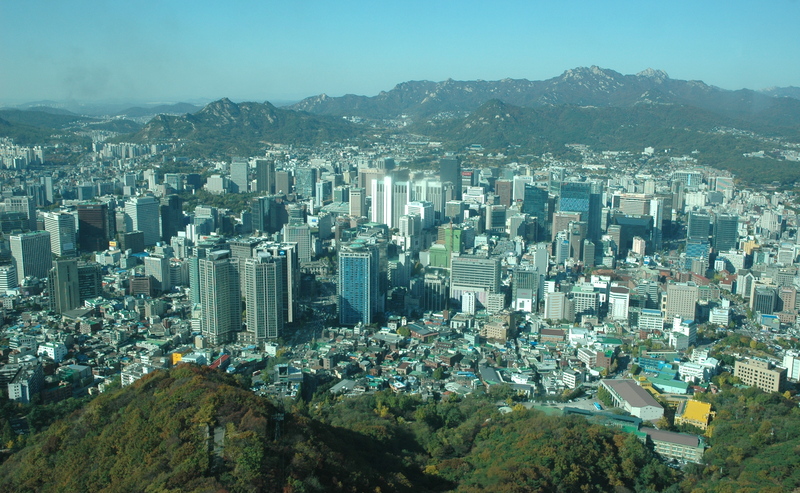 North Korea now has a population of twenty four million with an unknown GDP per capita, while South Korea has a forty nine million citizens earning an average income of $30,000. 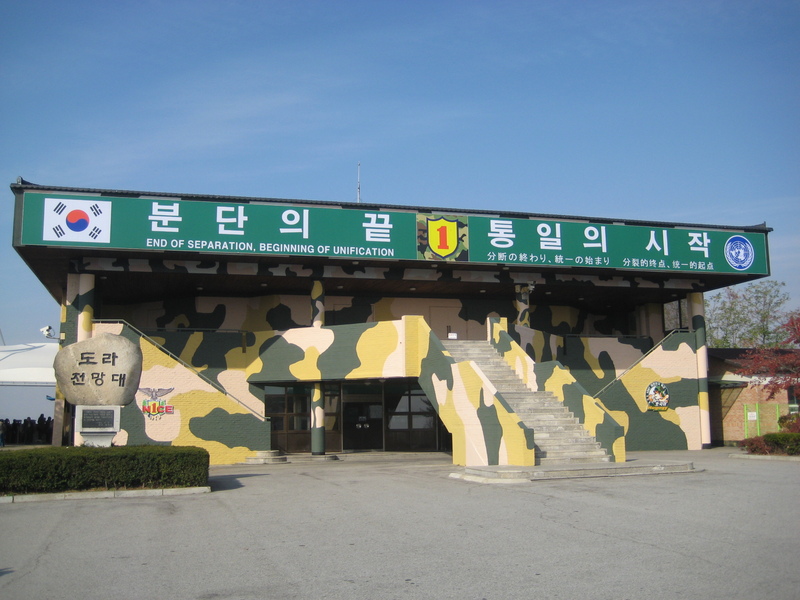 The opportunity to see the border was on an organised demilitarized zone tour that has become a tourist attraction with bus loads making the 64km journey from Seoul everyday. Ironically, natives of South Korea need to wait at least three months to make this trip, that’s if they pass the security background check, as many in the past have tried to flee to the north to reunite with family members. All that was required of us was to send an email and we were transported to a war zone – literally. 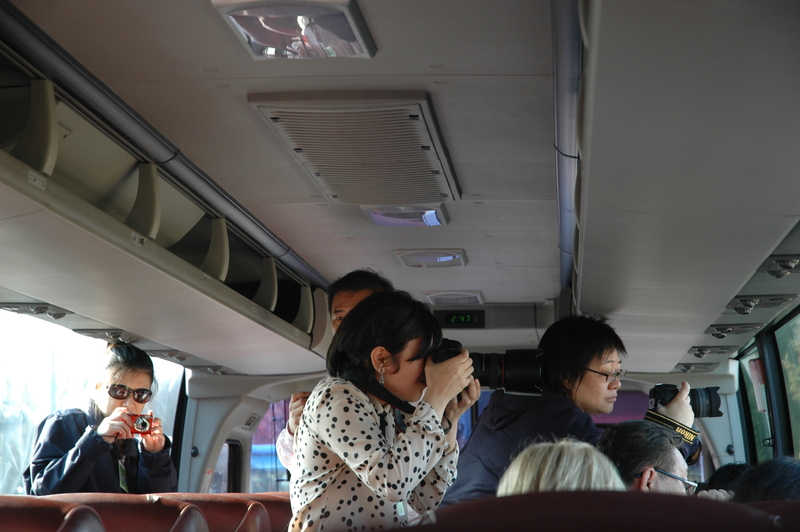 The tour is divided into several stops, beginning with the penultimate train station before the North Korean border, where it’s possible to buy fictitious train tickets to the North. Next is the itinerary is the ‘look out point’, one can view through binoculars the propaganda town of the North and it’s domineering national flag. After lunch and souvenir shopping, the tour moves onto the actual demilitarised zone where security is tight and tourists are required to dress smartly and conservatively for fear that North Korea take photos of you and make propaganda posters if you were a slovenly dressed westerner. On the actual border, where we got the closest experience of North Korea, South Korean soldiers stood half way behind the buildings with one eye on the enemy, so that they could duck easily if an attack was made. I worried about the sanity of these young men, with one eye on the north and the challenge it must be to stay hopeful about the outcome of this tortuous war. 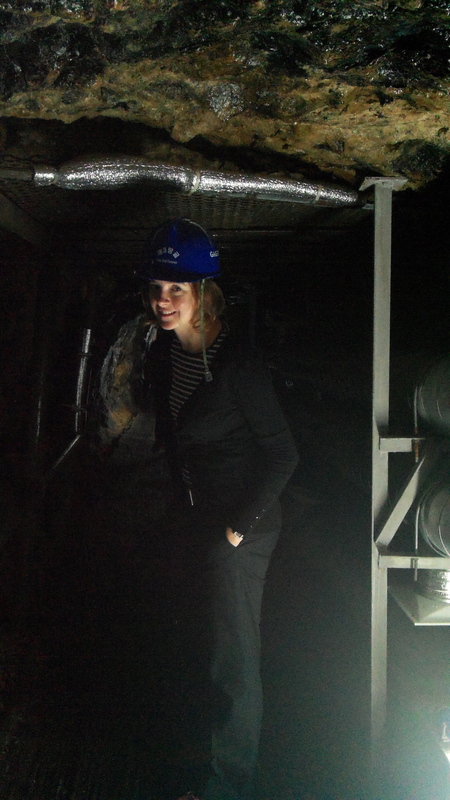 We travelled underground in a miner’s funicular into the tunnels that the North Koreans had secretly dug. I was saddened by the thought of those that had skirmished in this hellish hole, blasting through the granite, not fully understanding the purpose of the war. All hoping to achieve some sort of happiness, love and reward at the end of their sacrifice. It’s what we all dream about, right? But these ideals often gets forgotten in the confusion of conflict. 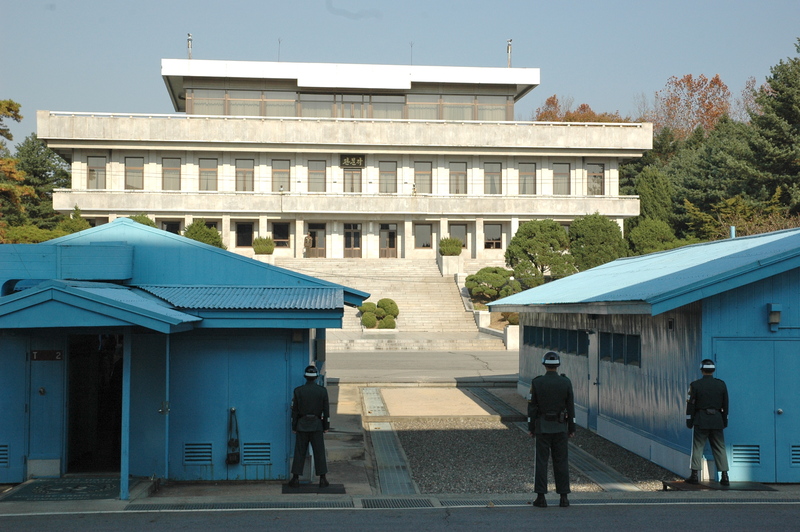 Observing this DMZ, I wondered what was this the best solution for reconciliation of a conflict? It seems sometimes it’s easier to build up fortified barriers than explore imaginative alternatives that get people talking and overcoming the divergence history, status and superiority. I thought when do people feel most equal? And had a frivolous idea, inspired by the Finnish tradition, to place a sauna building in the DMZ along side the plethora of other conflict related pavilions. Wouldn’t it be fun for the opposing sides to share a sauna, removing uniforms, dark glasses and weapons and possibly share a bottle of whiskey to the loosen the lips and get people laughing and talking again. After a bitterly fought Korean war between 1950-53 with two million killed overall, the South created a society of opportunities, individualism and a place to laugh smile and fall in love. Every country creates propaganda in order to maintain cohesiveness, making people believe that they are living the best possible life. Both North and South Korea are guilty of using propaganda, yet the North’s approach is considered more dangerous. In 1998 the Hyundai founder in the South sent one thousand cows into North Korea as gift for the poverty stricken citizens, simultaneously North Korea built a fake ‘perfect village’ with actors to be viewed from the South Korean platform. While sitting in Starbucks in Seoul I noticed a young man sitting beside me in his suit, typing on his laptop. I guessed he had probably already done his military service, stood on the fortress wall and wondered when he would be able to get on with his life. South Korean men are required to serve twenty-one months for their country, whereas North Korean men will serve ten years, generously reduced from thirteen. When so much of these young lives are wasted on defence, when is there time to be a husband, a father and be educated? 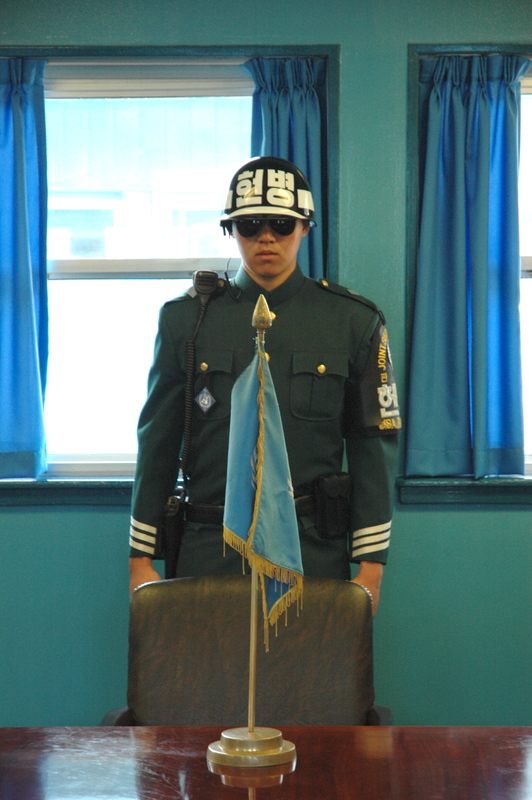 After the DMZ tour, I chatted with one of the US Soldiers called ‘Futch’. He was disappointed that he was serving his time in Korea, he would have preferred to be in Afghanistan and hoped to be stationed there next. He spoke dispassionately about the experience saying “This place feels really safe, you don’t feel like you’ve served your country, unless you’ve been to Iraq or Afghanistan, those guys are having all the fun out there”. He explained to me the benefits and attractiveness of joining the military that once your service is completed and if you survive the experience, you’re college tuition is paid for, you’re given an allowance for books and an allowance of $2000 a month. Futch said he probably won’t go college when he returns, but will get a job with the prison service and will even get a promotion for his military service. At the moment, the army is overrun with applications to ‘serve’ as there is good money to be made, compared to economic holocaust surrounding elsewhere, but the benefits and contribution to society require considerable more debate. South Korea talk confidently about the unification of their country and welcoming back it’s North Korean citizens. But less consideration has been given to how this will affect the economy and current supply chains. A large percentage of manufacturing for South Korean companies is done in North Korea where labour is only $100 a month which has risen from $50 when the companies first started to setting up there. If this trend continues, who would really benefit from the unification? The large corporations would make more profits and there would be fewer jobs for South Koreans. South Korea has built a train station on the most northerly point of the country with the hope that when unification happens, movement will move freely across it. 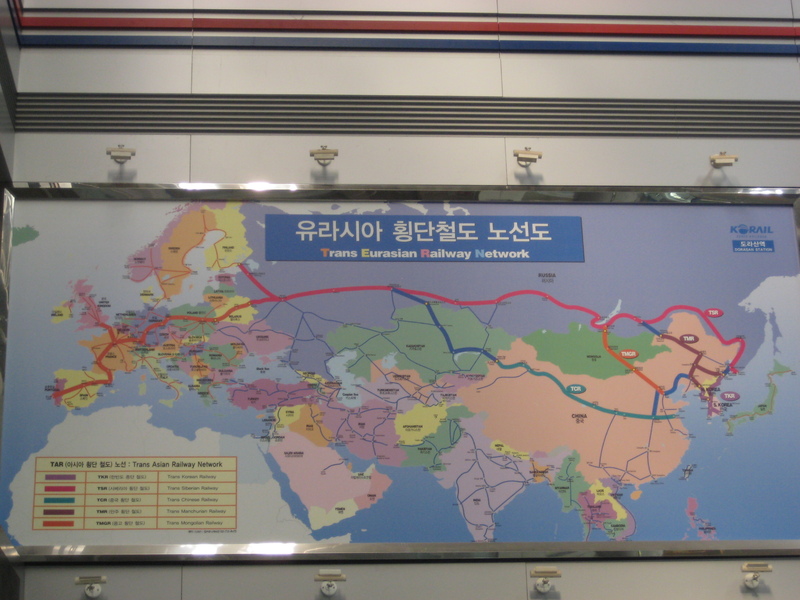 One of the main motivations is to connect the railway to industrious China. Storage sheds have been built on the border with the hope of it becoming a distribution hub, and ending it’s isolation as an effective island. It was a strange experience to stand in this station, with no trains, empty customs rooms, souvenir shops and with soldiers blocking the access to the turn styles. 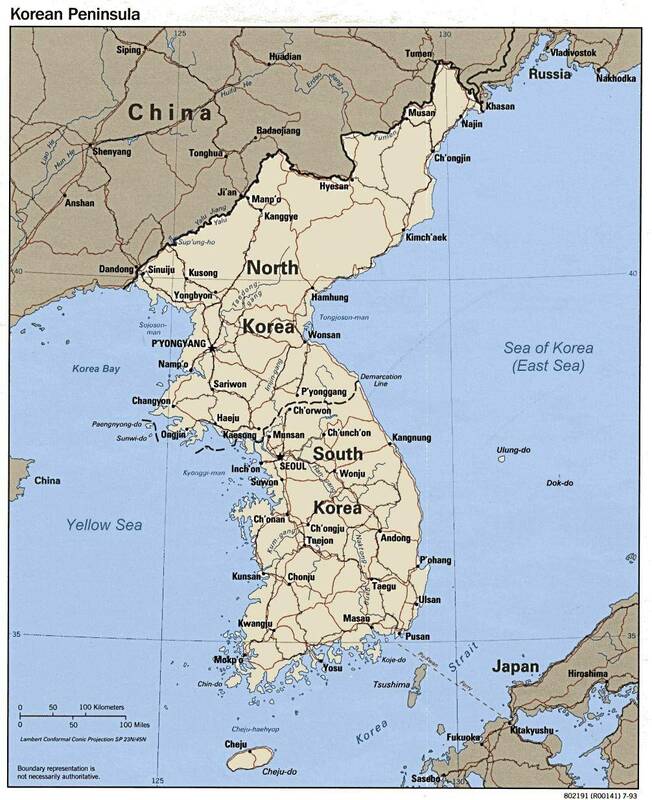 Will the day ever arrive when this space becomes a progressive interchange or will it remain an instrument of South Korea’s propaganda. What now for North Korea? China has adapted it’s communist ideology out of necessity, but Korea wants to remain loyal to it’s established roots, I wonder if this resistance is down to pride. North Korea has been shown up by it’s more successful brother across the border who has been successfully recognised on the world stage. I wondered if open communication was able to infiltrate North Korea, would anything change? The physical boundary would seem pointless, if people could speak to each other from their separate living rooms in the North and South of the country. If the citizens of North Korea could get an understanding of the world without the propaganda, they could then decide what kind of life they would like to live and create or join a nation around these ideals. Can North Korean be condoned for their desperate attempts to tunnel under the border, could they really achieve a convincing attack sending young men under ground hungry and without any vehicles? Pride made them cover the granite tunnel with coal dust, yet I don’t believe South Korea should make a tourist attraction out of another nations desperation. In the past six months North Korea has been closely watched with it’s ascending new leader Kim Jong-un , it’s continuing disintegrating relationship with the South and more recently launching a shuttle into earths orbit. What could be the prognosis for this deeply divided territory, what is the economically most advantageous solution? and what will make the most sense for the ego’s and minds in control? I believe the conflict will remain as long as there is a propaganda machine to keep the animosity alive and be-little a nations pride. This entry was posted in South Korea and tagged Demilitarized Zone, Korean Military, North Korea, Reunification, South Korea, War tourism. Bookmark the permalink.